Redshirt sophomore running back Rey Green takes a hand-off from quarterback Dalton Sneed during the first day of Montana's fall camp at Dornblaser Field. Green ran the ball one time for minus-1 yard in the 2018 season. MISSOULA — Montana's already-thin group of running backs took another hit when Rey Green announced that he was leaving the school on Saturday. Green, a redshirt sophomore in 2018, tweeted that he's transferring to Mt. San Antonio College, a junior college in suburban Los Angeles. "The lord works in mysterious ways, but he has a plan for me," Green shared in a note on Twitter. "My journey has had its ups and downs, highs and lows, through it all I've became a better man and smarter football player. The knowledge and lessons that I've learned during my time at The University of Montana will never be forgotten. The friendships that I've made will last a lifetime but my time at Montana has come to an end, with that being said I will be transferring to Mt. Sac. I'm very humbled and blessed with the opportunity with another chance." Green ran the ball one time for minus-1 yard in the 2018 season. 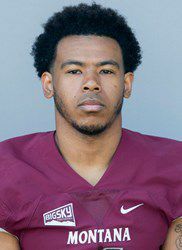 He was "expected to be a major contributor to the 2018 Griz rushing attack," according to his bio on Montana's website, but he got stuck behind first-year transfer Adam Eastwood, senior Jeremy Calhoun and senior Alijah Lee. The Vancouver, Washington, native redshirted as a true freshman in 2016. He missed the 2017 season because of an injury he sustained in fall camp. Green is the third player to leave the 2018 team. He joins Calhoun, who announced his intent transfer in December, and junior wide receiver Lamarriel Taylor, who left in October for personal reasons. Montana's rushing attack in 2018 was led by quarterback Dalton Sneed (675 rushing yards) and Eastwood (514 rushing yards). Eastwood is the lone returning running back who saw action in 2018. Fullback Levi Janacaro and quarterback Garrett Graves, who lined up at running back, combined for 47 yards on 15 carries.